Huge, modern, ugly and imposing, this monster exhibition hall plunked down in a genteel Paris neighborhood looks like some visitation from Outer Space, but it hosts some of Paris's most interesting exhibits. 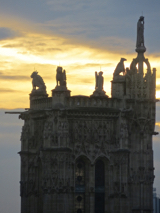 Tour St-Jacques at sunset, seen from the Pompidou Center. The full name of this huge, futuristic arts center in the Beaubourg neighborhood of the Marais, a few blocks north of Paris's Hôtel de Ville (map) is Centre National d'Art et de Culture Georges Pompidou. Like the Eiffel Tower, it was despised by many when it was built. The Centre Pompidou's bold exoskeletal architecture and bright colors were seen as out of place in the graceful old Beaubourg neighborhood. But it soon became clear that it would not go away, and many detractors have become grudging admirers. As you approach the Centre, you'll know it when you see it: enormous colored pipes bind its exterior, running in mazes, up, down, and across. Overview of the Pompidou Center, Paris. L-o-n-g transparent escalators run up its façade, trundling visitors among the various levels. There are some wonderful views from the upper levels, and great photo ops of Notre-Dame, the Tour St-Jacques, and other landmarks. All of this mechanistic paraphernalia is not just for show. The necessary systems for heating, ventilation, electricity, communications, and protection are all carried in the walls, and this allows the vast interior to be completely open, perfect for art and cultural exhibitions. The Centre Pompidou houses the Musée National d'Art Moderne, including works by French and foreign artists and sculptors from the turn of the century up to the present time. Marc Chagall is well represented here, and the distinctive geometric work of Piet Mondrian is also on view. The museum offers free Wifi access to visitors. Check the Centre's website (which has an English-language section) for current exhibits. Just across the Plaza from the Beauborg is the Atelier Brancusi. Constantin Brancusi, a Romanian-born sculptor who lived in Paris for much of his life, bequeathed his entire studio to France, on condition that it be reproduced exactly as it was at the time of his death. No admission charge. A bit further down is the old church of Saint-Merri, just behind the fountain with its fanciful and colorful sculptures. Paris Museum Pass accepted. Closed Tuesday. Open evenings. 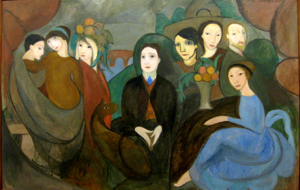 Above, Guillaume Apollinaire and his friends, by Marie Laurencin. 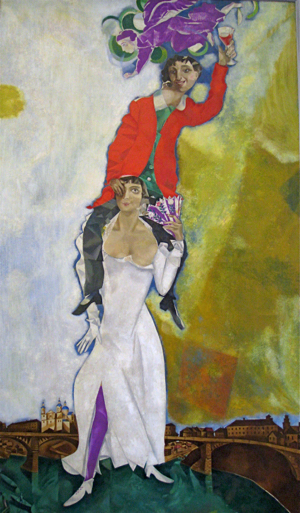 Below, Double Portrait with a Glass of Wine, by Marc Chagall.